The refugee statistics are appalling. The last few years have seen the highest levels of refugees on record. The topic is everywhere — on television, online and on the minds of those displaced and those trying to help. To grasp how big the world refugee crisis truly is, below are 15 statistics on refugees worth knowing. Nearly one in 100 people worldwide have been pushed out of their homes due to war or political instability. Including 5.2 million Palestinian refugees, the total number of refugees in the world today is 21.3 million. This does not include internally displaced persons (IDPs) who have not left their country’s borders but were forcibly moved from their community. More than 65 million people are affected by war and power struggles including IDPs. Fifty-three percent of refugees come from Somalia, Afghanistan and Syria. Respectively, 1.1 million, 2.7 million, and 4.8 million refugees came from these countries. The Middle East and North Africa host 39 percent of refugees. Africa hosts 29 percent, Europe and the Americas host 18 percent while Asia and the Pacific host 14 percent. Turkey, Pakistan, Lebanon, Ethiopia, and Jordan rank as the top hosting countries. The number of people seeking asylum in Europe has also reached a record high of 1.3 million. Most of these refugees are from Syria, Afghanistan and Iraq. Germany, Hungary and Sweden have become the top destination countries in Europe for refugees. In the history of statistics on refugees, the last five years have seen the greatest rate of increase on record. The greatest rate of decrease occurred between the years 1994 to 1999. The lowest recorded number of refugees was in 1963. Nine out of 10 refugees head for neighboring countries. Most do not seek asylum in industrialized countries. About 86 percent are hosted in developing countries. Pakistan and Iran house nearly 95 percent of Afghan refugees. Turkey, Lebanon, Jordan, Iraq and Egypt house nearly 95 percent of Syrian refugees. The U.N. Refugee Agency was underfunded by $10.3 billion dollars in 2015. It is estimated that the annual cost of U.S. airstrikes against ISIS in Syria will be $10 billion. Several countries are doing their statistical “fair share” to assist in the latest refugee crisis. Canada is at the top of this list, receiving almost 250 percent of its estimated fair share of refugees. Norway is second, accepting 144 percent of its fair share, and Germany is not far behind, welcoming 118 percent. The countries that accept the least of their fair share include the U.S., Spain and France, all standing at 10 percent. Japan, Russia and South Korea rank last, having accepted zero percent of what would be considered fair. The largest refugee camps in the world include Kakuma Camp in Kenya, Zaatari in Jordan and Yida in South Sudan. Each of these camps hold more than 70,000 people, which is more than the population of Boston. Many case studies illustrate the need for clean water. In Kakuma camp, households that had access to 110 liters of water per day saw 11 cases of cholera; those who had access to 37 liters of water per day noted 163 cases. 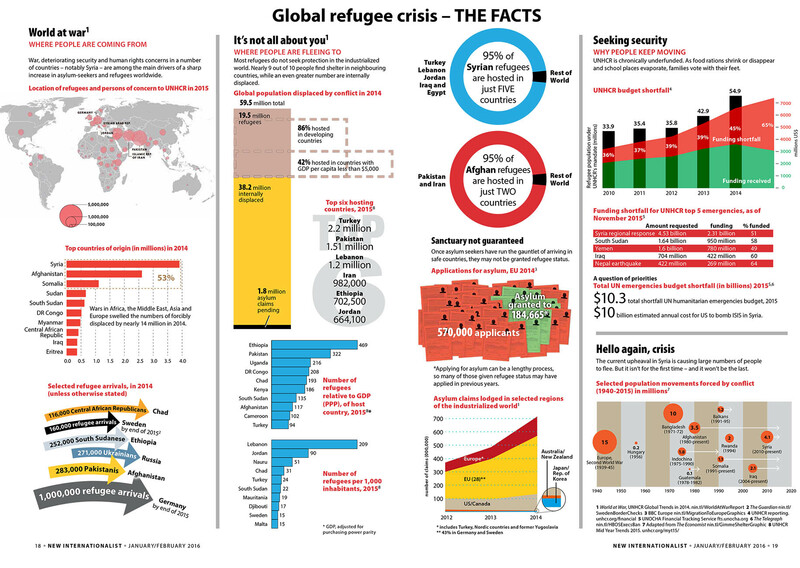 These statistics on refugees show the extent to which this unprecedented crisis has affected the world. Certain regions are more affected than others, but affected most are the displaced persons themselves.